Enjoying coffee, tea, or sodas throughout your day may give you energy, but it’s not helping your teeth. Years of stains from dark-colored foods and drinks make your smile look yellow or dull. Even if you brush and floss twice a day, it still may not be enough to give you the dazzling smile you want. Here are a few options both store-bought and professional to help you get a whiter smile that can light up Macedonia, OH. Simply brushing your teeth, flossing, and using a dental rinse is a smart place to start. Put a travel-size toothbrush and toothpaste in your purse or briefcase to have at work or school. Any time you use the restroom or take a coffee break, give your teeth a quick refresh. You'll be improving your oral hygiene in addition to brightening your smile. If you would like to try store-bought products to make your smile whiter, you might see minor improvements by simply brushing with over-the-counter whitening products. At many retailers and pharmacies in Macedonia, OH, you can purchase any brand of whitening products to try at home, such as activated charcoal or a tooth whitening toothpaste. Brush your teeth with these products per the directions provided. Bleaching kits with trays can be found in stores and may have the same look and feel as the dental trays that a dentist makes. The difference between store-bought and professional teeth whitening systems is customization. The mouth trays in whitening kit you buy at the store may hurt to wear or give you splotchy results. The bleaching gel in a store-bought kit is also not designed to fit your specific needs, so you may end up with tooth sensitivity and other issues. To increase the power of your chosen whitening gel or strips, you can use a special light. Available as an LED light mouthpiece, these devices should be worn as instructed after you have applied the whitening strips or gel. Remember that store-bought products are not going to give you the same results as teeth whitening treatments performed by a dental professional. Store-bought products have limited strength, so if you have any restorations (bridges, crowns, inlays, or onlays), your smile will be visibly uneven. Plus, the use of these products frequently can make your gums feel tender and cause tooth sensitivity. Ask your dentist if they recommend store-bought whitening treatments for you. At your dentist’s office, your exam and cleaning can not only help the health of your teeth, but they can also improve your smile. Eliminating the tartar and plaque from your teeth is an excellent way to making your teeth look whiter. If you want more dramatic results, talk to your dentist about cosmetic teeth whitening treatments. Your dentist may offer laser teeth whitening, custom home whitening kits, and veneers. 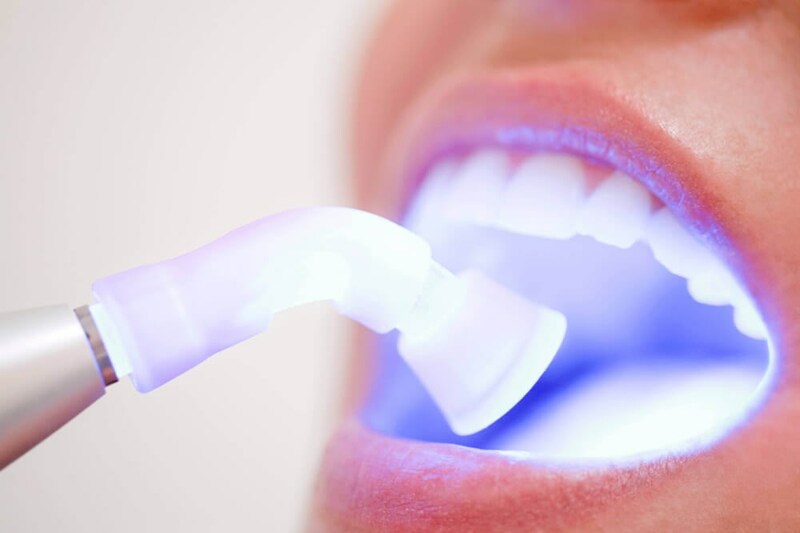 If you’re tired of minimal results or tooth sensitivity caused by over-the-counter teeth whitening products, schedule a consultation with your dentist to learn about professional teeth whitening options. DentalWorks in Macedonia, OH offers home and in-office whitening treatments, as well as veneers. All of these options will be customized to achieve your needs and goals, so you get great results. You can ask about our professional whitening options at your next visit or call to schedule a consultation to get closer to a bright, confident smile.